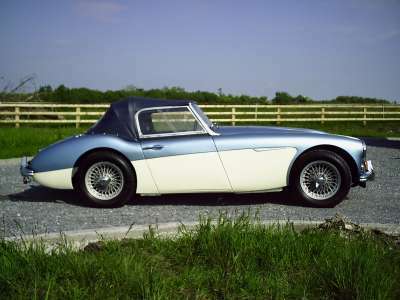 After finally moving permanantly to the UK I decided the time was right to finally try and find a Healey that I could use in Hillclimbs and Sprints, `Annie` is a great, strong car but I didn`t want to modify her as she looks great just as she is. I found a really great fast road car and took the decision to buy it even though I still had Annie. No worries though as I sold her in 2 days. after the long and expensive restoration. I won`t reveal how much it cost! ANI 100 is an Irish plate from County Wicklow. Unfortunately since the late eighties, they can`t be transfered to England, where it would be worth about 5,000 pounds! 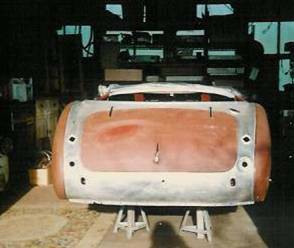 Both shrouds are original.The damaged front shroud was repaired by a retired aircraft worker who amazingly also made the aluminium bonnet for the De Lorean press release car, as production of the stainless steel one was delayed. All the heavy duty bits including rear axle, hubs, drums, dampers bellhousing and gearbox are original but most of the shiny bits, lights and other accessories were all new. First job completed. The Moto Lita wheel is now installed. As the car already had a modified indicator switch mounted on the dashboard, I chose not to re-install the original trafficator. Instead I opted to purchase the matching Moto-Lita horn push with Austin Healey badge and I think the result gives a very clean appearance. The boss itself is also brushed aluminium. Well it looks identical to my old car! That wasn`t the intention, I spent a year searching for a car to create a red Rally Replica but never found anything suitable at a sensible price. This car came up for sale in the west of Ireland and quality for price it was just too good to pass up. `Annie` although a very early Longbridge 100-Six is in fact a real mongrel. As well as the 3000 engine, MkII frame and DD300 radiator (one of! 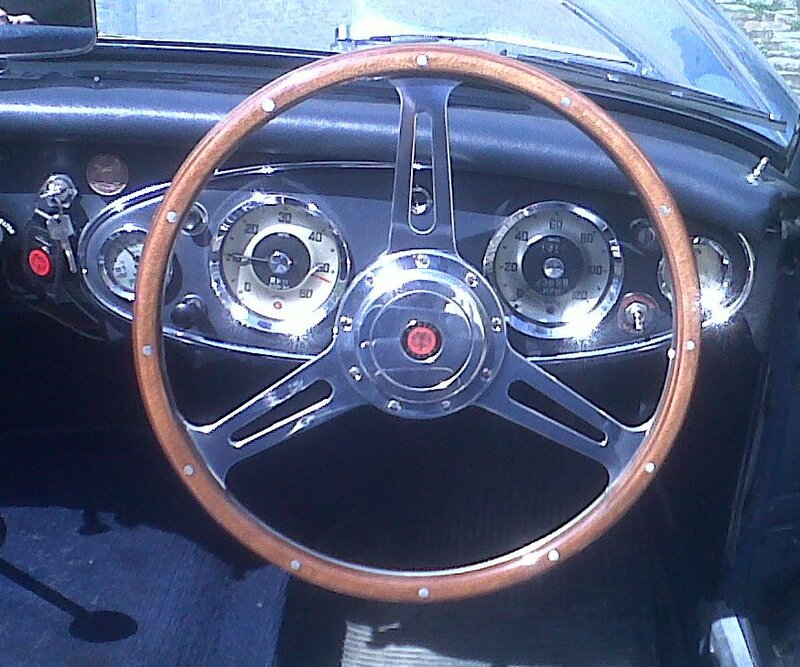 ), she also sports HD6 carbs and an interior re-done in the style of the later Abingdon 100-Six/3000s. None of that bothers me in the slightest. She is a great car that runs straight and has a very strong engine. After a brief test drive I had no heistation in driving her to the UK. A fantastic, 700km drive across Ireland, Angelsey and North Wales and up to the Lake District in Cumbria. She never missed a beat. 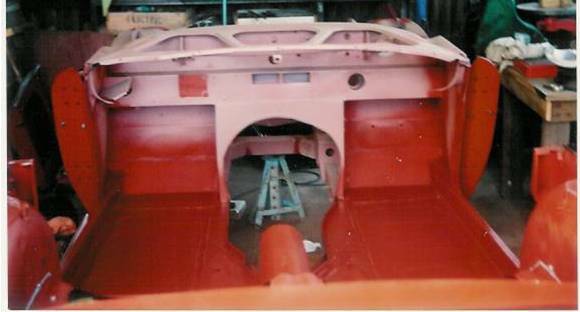 This was the basis for the rebuild which included many new body parts, including wings, inner and outer sills, floor panels and boot floor to mention just a few. As Ray told me - `AH Spares did very well` - and I have the invoices to prove it. ...a typical barn find being trailered away for restoration in 1988. Note the Teal Blue colour on the passenger door card. 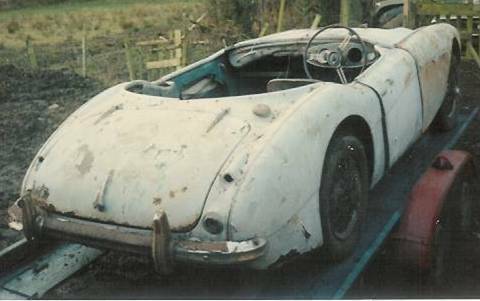 Very rare and absolutely correct for this early car which was originally Healey Blue/Ivory White when it left the factory. 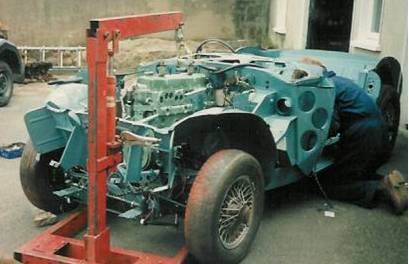 The wrecked car was purchased in 1988 by Ray Cowan of Dublin who began a total restoration in 1990, which took about two years before the car finally appeared on the road again around 1992. 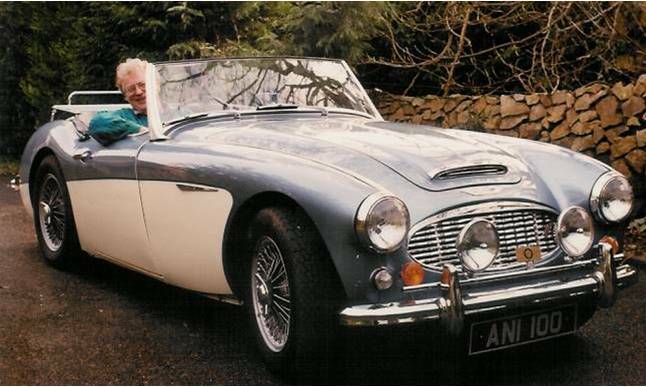 In 2005 the car was sold to Con O`Donaghue from Ennis in County Clare on the west coast of Irleand. Con, being a bit of a perfectionist, decided to have the car repainted again, as it had suffered some minor scaring from roadchips. The colour is a Peugeot production paint straight out of the tin. 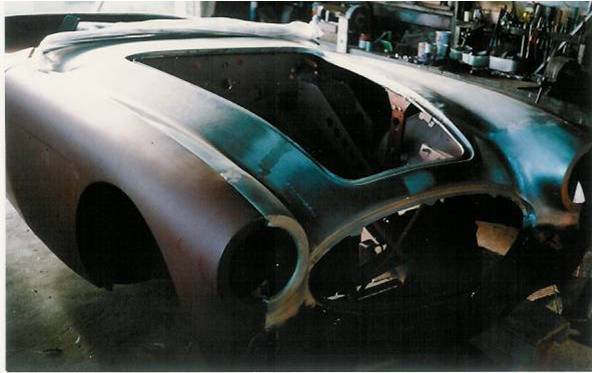 It was a real quality respray and looks fantastic as you can see below. The engine is interesting. It is a 3000 motor and was brand new (NOS) still in its original waxed paper and delivery crate! Even now it has only done 27,000 miles.